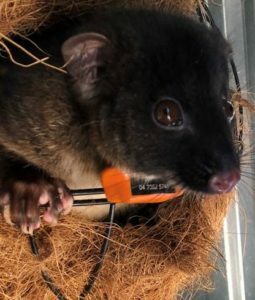 The University of Western Australia’s Associate Professor Roberta Bencini has been working with Sirtrack, a New Zealand company specialising in Radio Telemetry, to find a light and safe radio collar for the 40 western ringtail possums that will be monitored each year over the next five years. All possums will be coming from the homes of FAWNA carers who have raise the animals from joeys that have been orphaned. Some concern about radio collars has been expressed as to how they might influence an animal’s normal behaviour and whether they could put the animal at risk of injury or death. This is always going to require a trade off if we are going to learn the long-term fate of these ringtails raised in captivity. Professor Bencini has sourced a collar that is both lightweight (approximately 20g) and with a sufficient range and six-month battery life. The radio collars also have an expanding elasticised band which will degrade over time and release the collar. The researchers plan to locate the possums and remove the collars before the batteries are exhausted but the measure built into the collar will cater for those possums that may not be located. 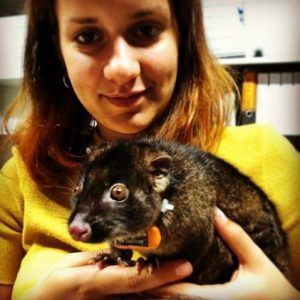 The images below depict Masters Student Arianna Urso with one of the sub-adult Western Ringtail possums that are trialling the radio collars. You will note they are bright orange. Future versions will be matt black to avoid alerting predators to the presence of the study animals. The possums that have been wearing the trial collars have shown no ill effect or change in normal behaviour, which is positive. All of the study animals will be microchipped and radio collared prior to their release in pre-determined locations in the South West region. They will also be tested for their personality with a short 10 minutes behavioural test, prior to their release, which will help us to determine if bold animals have a better chance of survival. This project is supported by the South West Catchments Council through funding from the Australian Government’s National Landcare Program.